Good news for those who commute to the airports via Express Rail Link (ERL). 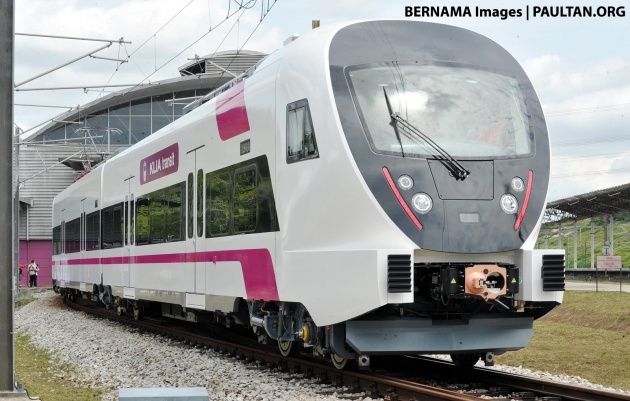 Six new train sets will start operating on the KLIA Ekspres and KLIA Transit services in March 2017, Bernama reports. Each train set consists of four cars and will operate at a cruising speed of 160 km/h. Transport Minister Datuk Seri Liow Ting Lai officiated the unveiling of the first new train set at the ERL depot in Salak Tinggi yesterday, and he said ERL’s capacity will increase by 50% with the six new trains. He said that ERL had performed very well last year, growing by 20% to an average daily ridership of 30,000 despite rising operational and maintenance costs. “With the increase of 50% capacity, I am confident that ERL will welcome its 100 millionth passenger very soon,” Liow added. ERL executive chairman Tan Sri Mohd Nadzmi Mohd Salleh said the purchase of the new trains from China’s Changchun Railway Vehicles Co Ltd (CRRC) would add to its existing fleet of 12 trains, bringing the total number to 18. Two sets of the new trains will be for the KLIA Express and the other four for the KLIA Transit, he revealed. This will boost daily ridership from 12k to 30k for the non-stop KLIA Express and from 30k to 60k for the KLIA Transit. For the latter, waiting time will be reduced from 20 to 15 minutes during peak hours, and from 30 to 20 minutes during off-peak hours. The new train sets also have longer maintenance intervals; and with overhaul cycles extended by 30%, it would translate to more capacity, less downtime, and savings in operating expenditure. Increasing fare & capacity at the same time will not encourage the public to use the ERL. Just another alasan to increase tiket price. Yeah, & make sure the train stop right at your door step. Unproposional, to high with small wheels,looks as Persona or maybe is this new design trend here. Hispeed trains uses small wheels, this is not steam locomotive. Compare train and a car.. How stupid malaysian can be.. I hope you stop having offsprings.. I wonder if people actually bother with it. if you have more than 1 rider, it is cheaper to take a Grab/Uber and it is door to door service. Malaysian should been given lower fares…stick to old price RM35 for one way journey KLIA Express. Let foreigner or tourist pay more. This is what happens when they build because the want to, instead of build because they need to. The number of pipu requiring the ERL service is limited. The same goes with the HSR, I can already guarantee the same story will arise, because of low passenger counts.